A Pennsylvania woman has forged an internet sensation with a blog post about making freeze-ahead meals for her family -- 46 of them, to be exact, for about $95. Snapping up closeout deals on meat, carrots and peppers, and buy-one-get-one-free deals on potatoes and onions, Natalie assembled a mountain of raw meat and vegetables, "sucking it up and committing to an afternoon of slaving away in the kitchen," as she wrote on her blog, for the big pay-off over the next few months: "Tomato Basil Soup, Sesame Chicken, Balsamic Roasted Chicken Thighs, Parmesan Garlic Chicken, Buttermilk Herb Chicken, Pesto Chicken, Cranberry Chicken, Dijon Pork Roast, Bourbon Brown Sugar Pork Chops, hamburgers, teriyaki anything!" What we can take from this post is a number of ideas on making your own convenience foods without the convenience markup. If you don't know what I mean, head to your grocery store's freezer section, choose a frozen prepared meal and compare prices by the pound. At random, I selected Bertolli Mediterranean Garden Rigatoni And Broccoli Chicken. At my local Safeway, I can buy the Bertolli frozen meal for $5.97 a pound. But if I price out the ingredients -- a whole chicken, some pasta, broccoli, a couple of red peppers and a hunk of parmesan cheese -- even assuming I get organic whole wheat pasta, broccoli crowns instead of whole broccoli, and I use a whole eight ounces of parmesan for one dish (highly unlikely), my price is just $1.99 a pound.This is why making your own freezer meals make so much sense. You get to choose the ingredients yourself (whole wheat pasta, organic broccoli, a favorite brand of parmesan, and -- umm -- no chemicals or preservatives), and you can save a ton of money over the packaged convenience version. But there's this little matter of "slaving" in a kitchen for an entire afternoon, right? C'mon, I know you were thinking that. And there are chicken bones! And so much chopping. Is it really worth it? 1. Not all meat is raised equal. The chicken in a random sampling of three different medium-priced frozen meals included "chicken breast meat with rib meat," "water" and "soy protein isolate." Yum, right? And do you know where this chicken comes from? A very large farm that is probably not worlds better than the one in Iowa that was responsible for the salmonella outbreak last year. Here's just one example of some of the bad things that can come from industrial chicken farming. Yes, the whole chickens come from those farms, too, but they have to look a lot nicer to be sold in grocery stores rather than sent straight to processing plants -- the chickens that go straight to processing are probably the least attractive of the lot. By making your own meals, though, you have the option of selecting a smaller farmer at yes, a slightly higher price who adopts practices with which you agree. I've written a lot about how I bought a quarter of a grass-fed cow for less than $3 a pound (including steaks and tenderloin! ), just another example of making choices about the meat you consume -- for your own health and that of your family. Tip: Learn to cook a chicken whole. It's really not that hard. 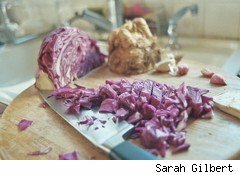 Natalie of A Turtle's Life for Me describes her process with whole pieces, and it's the same with a whole chicken: Put the whole shebang in a pot of salted water with chopped carrots, onions, and celery (herbs, like fresh thyme and rosemary, are recommended, too), and simmer for about an hour. Skim out the vegetables and add them to your compost heap; strain out the stock to freeze; and, using your fingers or a fork and knife, shred the chicken meat. Chicken tacos, chicken salad, chicken with broccoli, and yes, chicken teriyaki! Jamie Oliver has some more great ideas for what to do with shredded chicken in his typical cheeky Brit style. 2. Organic vegetables are cheaper bought raw. Do you know how bad pesticides are for your family? Even if you haven't read any of the abundant research or news on pesticide-laden food, let's just think about this: Pesticides kill living creatures. Pesticide residue does not just stay on the surface of the food -- it enters the soil and is taken up into the leaves and flowers of the plant (hello, broccoli and spinach and lettuce). Washing your produce may remove some residue, but it doesn't wash off what is, by now, part of the molecular makeup of your veggies. Would you eat just a little rat poison, if it was going to make your food cheaper and was (after all) diluted throughout your food? Of course not. But you'll eat plant poison and bug poison for the same reasons. While agencies have assured us it's safe, I'm not willing to take that risk any more (especially as plenty of other agencies cry "no way"). This study linking pervasive development disorders (like autism, with which my middle son has been diagnosed) to prolonged pesticide exposures has me creating an at-all-costs limit in my household. You may have more tolerance, but it surely can't hurt your children if you remove toxins from their diets, and it's far cheaper if you're buying the vegetables whole and adding them yourself into the frozen meals. Tip: Buy large quantities of veggies through buying clubs or by joining forces with a group of friends. My friend, Heather, asked me last week if I wanted some green beans because she had bought a bushel. She sent me home with a gallon-sized bag of organic green beans she'd bought from a local grocery store for a 15% bulk discount. Most grocery stores and co-ops have deals like this, or you can join a buying club near you where the organizer buys direct from a farmer and shares among club members. Or, if you like, negotiate directly with a grower at a farmer's market or from a nearby farm. Get a couple of neighbors together, and you can share the work to freeze it, too. 3. Mama don't like chemicals. I've avoided processed foods, with the occasional exception for bits present in my favorite brands of potato chips and ice cream (I do have my weaknesses), for several years now. Because of that, I've become so sensitive to chemical preservatives and flavoring agents that, when I do eat something highly processed -- say, a major brand of salad dressing or a hamburger bun at a fast-food restaurant -- that I have a strong reaction to it, often getting a terrible headache that will last for hours or just feeling jittery and off. But let's say you don't give a hoot about chemicals in your body -- mold inhibitors, artificial colorings, minimally toxic preservatives. You still might want to think about what the presence of chemicals means: It means the food wasn't very good to start with, and the process of cooking and packaging it took a lot out, too. Chemical flavorings are added in to cover up the fact that the meat or produce used was not very flavorful (picked unripe, for instance, or grown in chemically-fertilized soil, which leaves fruits and veggies bland). Do you want food that fakes at being delicious through extra salt and chemical flavorings, or do you want food that's really delicious? I think my family deserves honest, authentic yum. Tip: Heighten the flavor of your food with leftover bits. Every time I squeeze the juice out of a lemon or eat a great organic tangerine, I take a few minutes first to peel off the zest with a paring knife (you could also use a potato peeler or zester). I'll chop this finely and add it to pesto, granola, muffins or cookies, or I throw big pieces into a pot of beans or a fruit dish, such as a cobbler, crisp, pie, etc. What's left is dried on a plate on the counter and put in a jar for later inclusion, or dropped into a jar of vodka for orange or lemon flavoring for baked goods and desserts. Same thing goes for leftover bacon or other cured meats (cubed and tossed into tomato-based sauces and soups, or a pot of beans), bits of carrot and mushrooms and other vegetables (into your poaching liquid or as a rich vegetable broth to use instead of water in a soup or sauce recipe), leftover vanilla beans (it does things to barbecue sauce or seafood dishes), and leftover herbs. You get the picture. 4. Employees of food corporations don't love you or your kids. Why do you feed your family? Chances are, it's obligation mixed with a lot of love. Why do corporations hope to feed your family? To make a buck (or a bunch of them). So instead of choosing ingredients carefully to maximize flavor, freshness and nutrients, they'll choose ingredients carefully to maximize profit. Instead of chopping the red peppers extra small the way your daughter likes them or leaving onions out of a recipe because your son is convinced he's "allergic" to them, they'll do whatever is most efficient for the factory's throughput. The workers who make your meals wash their hands and avoid getting their hair into the food because of federal regulations, not because they have any personal stake in how healthful your food is. You, on the other hand, wash your hands because you worry about cleanliness, and you assemble foods you know your family will love because you want to see them enjoy the fruits of your labor. Instead of trying to find just the perfect product for your kids' varied likes and dislikes (if they're anything like my kids, they're constantly changing), you can tailor your recipes to suit their needs and tastes. You care about them, and it shows. Isn't it likely the reverse is true, too? Tip: Get together with friends for a freezer meal cook-off. I know a bunch of other mothers who make regular dates in someone's large kitchen for an evening of chopping, assembling, cooking and portioning. They each contribute one or two favorite recipes, purchase in bulk and share in the cost, and leave at the end of the night with memories of laughter, fun and grocery bags full of food meant for their own freezer. It's taking the "cooking with love" concept to its natural next step: making cooking for your family a communal effort that ends up being as good as a girls' night out. It would be a fun idea for a baby shower or a housewarming party, too. If the honoree is a famously enthusiastic cook, ask her to provide the recipes and join together for a celebration that will end up with nourishment for a new adventure. Next time you're tallying up the grocery list for your family, consider this possibility and ask yourself: Could I do better, and cheaper, for my family by cooking my own convenience foods? There's a wealth of information and resources to help you in the process, and your budget, and your mealtime stress, could be greatly reduced. It's worth a try, right?